After a couple years as a ski bum out west, Jackson Pierce felt the tug of home. The former NMC automotive technology student’s timing was perfect for his skills. 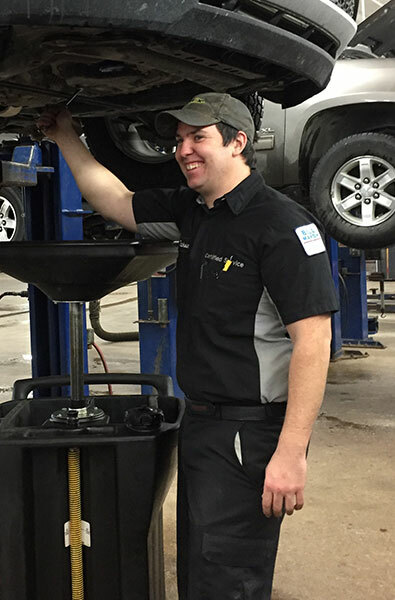 Pierce traded ski groomers for cars, and has spent the last two years working at Bill Marsh Automotive, one of several regional repair shops to which Automotive Technology program director Wayne Moody has built an employment pipeline. “Everyone needs their car fixed,” said Pierce, of Northport, who attended NMC’s automotive program in 2007-08. But not everyone can fix them. Moody said an aging auto repair workforce combined with increasingly complex, computerized cars has created an opportunity gap that he has worked to fill with NMC students like Pierce. The Grand Traverse area’s population growth also fuels the local hiring demand. At least six former NMC students work at Bill Marsh’s Garfield Road locations. Fox Grand Traverse employs another eight, including its first female technician since 1992, KT Rafferty. As it has traditionally, the job attracts students who like hands-on work. But it’s more than turning a wrench nowadays. “It’s not rudimentary. There’s an immense amount of problem-solving,” Pierce said. With cars loaded with dozens of on-board computers, electronics is another important skill set. Technicians are financially rewarded for that greater knowledge and as they gain experience. While an entry-level technician might make $12-$14 per hour, Moody said a graduate of the two-year program could be earning between $50,000 and $70,000 after five years. Six-figure salaries are not out of the question for the most experienced technicians. Registration for spring semester programs, including automotive, is going on now. Find out more about the program here. 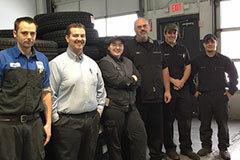 Above: From left, former NMC automotive students working at Bill Marsh's GM store are Mike Bouchey, technician; Tom Garrity, parts; Rachel Smith, Dave Panek, Jackson Pierce and Zach Schaub, technicians.